Before we can understand the different methods used to reach the Moon, we need to know a bit about how spacecraft navigate. More specifically, how a spacecraft in orbit around one body can transition into orbiting around another. As you might expect, being literal rocket science, these concepts can be a bit tricky to master. As such, we’re going to take a few liberties here to make things a bit easier to wrap the mind around. For one, let’s forgo the third dimension entirely and imagine that both the starting and destination orbits are on the same plane. Further, let’s say that the orbits are nicely concentric, that is, the orbit we’re looking to transition into is essentially the same as our current orbit, just at a higher altitude from our starting position. Obviously the Moon does not have a perfectly flat and circular orbit around the Earth, but that being said, it’s not a terrible analogy. Once the basics of an orbital transfer are understood, it’s not much of a leap to see how they could be applied to the Moon’s actual orbit around our planet. Though we’ll leave applying these concepts to more distant destinations in our solar system as a exercise for the reader. The other important thing to understand is how changes in velocity affect the orbit. When velocity is increased in the direction of travel, the altitude of the orbit on the opposite side of the burn is raised. The altitude and position at which this increase in velocity occurred would then become the lowest point, or periapsis, in a now elliptical orbit. The principle works the same in reverse, should the spacecraft fire its engine against the direction of movement. To put this into perspective of our 2D model, if a spacecraft fires its engine on the “right” side of the orbit, the change in altitude would happen on the “left” side. In this way the peak altitude of the orbit, referred to as the apoapsis, can be raised until it intersects with that of the target orbit. The spacecraft then drifts along this temporary transfer orbit until it reaches the apoapsis, where it fires the engine again to perform what’s often called a “circularization burn”. This maneuver raises the periapsis to that of the target, completing the vehicle’s transition into the new orbit. When the Apollo missions sent humans to the Moon, they obviously wanted to get there as fast as possible. Not only were living conditions cramped aboard the spacecraft, but the longer the men stayed in space the more supplies they would need to sustain them. So to minimize the time spent in transit to and from the Moon, the Apollo spacecraft transferred from low Earth orbit (LEO) directly into the orbit of the Moon. After launch, the Apollo spacecraft was put into a LEO “parking orbit” where the crew checked out the vehicle’s systems and prepared themselves for the journey ahead. 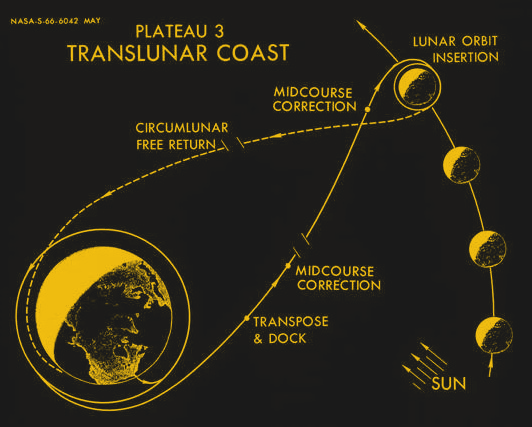 Once the spacecraft was in the proper position, they performed the Trans-Lunar Injection (TLI) maneuver, an engine burn that increased their velocity enough that their orbit would intercept that of the Moon. There were a few course corrections made along the way, and some braking maneuvers to slow down and enter lunar orbit, but overall the flight path is not far removed from the simplified model we looked at previously. This type of TLI maneuver is ideal because it gets you to the Moon as quickly as possible, but it only works if the vehicle’s engine is powerful enough engine to accelerate to the necessary velocity within the appropriate window. On the Apollo missions, the Rocketdyne J-2 engine increased the spacecraft’s velocity by a bit more than three kilometers per second in the space of just six minutes. But what if you don’t have the powerful J-2 engine of the Apollo spacecraft, let alone the mighty Saturn V to lift you into space? What if your spacecraft is the size of a bathtub, and its status as a secondary payload means the booster rocket can’t send it directly towards the target orbit? In that case, you’ve got to get creative. To reach the Moon, Beresheet will end up using multiple orbits to slowly raise its apoapsis over the course of the next month or so. On every orbit around the Earth, when the spacecraft makes its closest approach to the planet, it will perform a relatively short engine burn. Each burn will not only raise the apoapsis a bit higher, but will also increase the orbital period (how long it takes to complete one orbit). In other words, with each burn of the engine, the time until the next burn is pushed farther out. Once it arrives at the Moon, the spacecraft will perform a similar routine in reverse to lower itself down to the lunar surface. Because of the compound nature of these maneuvers, it’s easy to see why the trip will take so long. Should Beresheet miss any of its scheduled burns (which in fact, it already has), the transit time could be extended even farther. On the plus side, it allows the vehicle to reach the Moon with a very small engine, and gives ground controllers plenty of time to fine tune its trajectory and deal with any issues that may occur. Despite the incredible success of the manned Apollo missions, humanity never took the next steps towards fully utilizing our natural satellite. In the following decades only a handful of vehicles ventured back to the Moon, and most of those never touched down on the surface. But thanks to a rapidly developing Chinese space program, and the current Administration in the United States putting their weight behind a return to the Moon, we might finally finish the job we started in the 1960’s. If that is the truly the case, these “economy” flights to the Moon may start to become more common. Launching as secondary payloads and utilizing low-thrust orbital transfers could be a viable alternative to expensive direct flights. Payloads that aren’t particularly time sensitive, such as building materials, spare parts, or long-shelf-life foods could be sent regularly to the Moon using excess capacity on commercial launches; potentially creating a whole new market for the first company to develop a small general purpose lunar cargo vehicle. Perhaps one day Amazon Prime will be able to add the Sea of Serenity to their list of supported locations. The “beginner’s orbital mechanic” section was nice. It brought back memories from about 1972 when my physics professor told a joke (that none of us got/appreciated) that ended in: “consider a spherical cow”. March 18th, 2019. The only time in the entire history of humanity that this particular sentence has ever been used. but, do Beresheet in the woods? Only if someone is there to observe. And there’s the other problem. What to do once one gets to the moon. A moon base is going to take some doing, slow trip or not. Especially one that’s designed to be a jumping off spot for everything else. Ah, you mean “there is the existence of the other problem”. The other problem was not related to the text you quoted. Well unless Elon Musk’s roadster’s getting lonely up there the “other problem” justifies “foods ,spare parts, building materials”. So unless robotics and space manufacturing has come a long way that’ll be a couple astronauts living in a space mobile home while building not only something more permanent, but good enough to being used as a point for other plans. But their drones won’t work without an atmosphere! When you consider use on a lunar surface, those wheeled delivery robots they’re testing make a lot more sense. I’ partial to trebuchets or mass drivers for cargo transport on the moon. Without atmosphere to interfere, the accuracy and precision will be great! And they’d deliver it straight into your home without you ever needing to open the door…porch pirates will never stand a chance! Gerard K. O’Neill described in some detail in The High Frontier the use of mass drivers to get materials off the lunar surface. The idea was to get bulk ore out to the Lagrange points for building materials, with pinpoint velocity and position accuracy: final trajectory tweaks being provided electrostatically, down range of the launch but still near the lunar surface. It was a given that the orbital modeling and trajectory planning required would be possible by the time we would be able to build the colony structures. Someone (Stross? or Heinlein in TMIAHM?) pointed out that a malevolent AI at the helm could easily target structures on earth with such a tool. Very nice article, newsworthy and technical. For an active simulation of the orbital mechanics you discuss Kerbal Space Program is great. I am a recent player and find it fun challenging and educational. Stock KSP won’t work for this because it’s a 3-body transfer. You need one of the mods which add realistic gravity to Kerbal to do this. Why? It would be like using an ion engine to go to the Mun: just burn every time your at closest approach to Kerbin until your apoapsis is high enough to get an encounter. That’s not what’s happening here, really. What they’re doing is a low-energy transfer – when you burn to put your apoapsis out at the Moon’s orbit, you do it so that the Moon is approaching you and you do a gravity assist around the Moon. Hopefully multiple times, if you do it right (I think it happens twice in Berensheet’s case). See Principia’s guide on this: https://github.com/mockingbirdnest/Principia/wiki/A-guide-to-going-to-the-Mun-with-Principia . The problem is that when you start bouncing back and forth between the Earth/Moon spheres of influence, things go wacky crazy that don’t actually happen in real life. That’s the reason Universe Sandbox will not work (that and engines). I hate this description. It’s basically the same one SpaceIL gives, but it makes it sound as if all you’re doing is a standard orbital transfer, just broken up into several burns. But that’s actually not what’s happening, because that wouldn’t save you energy. The problem is that they’ve drawn the “leave Earth orbit” part from the Earth’s perspective, and the “enter lunar orbit” part from the Moon’s perspective. For a better idea of what’s happening, they put a video animation on YouTube a while back ( https://www.youtube.com/watch?time_continue=128&v=_R4zk448oPs ). I have no idea why they wouldn’t draw that orbital path. It’d look freaking awesome, especially in the Earth-Moon corotating frame. It’s a ballistic capture: you actually reach the Moon’s orbit *ahead* of the Moon, so you gain orbital velocity from the Moon (standard gravity slingshot: vout = -vin from the Moon’s perspective, so if vin=0 from Earth’s perspective, vout = 2*vmoon), and multiple encounters get you into lunar orbit very cheaply. It’s not the fact that the burns are spread out. It’s the fact that you’re using the angular momentum of the Moon to save you fuel. The goal is not to save energy, I’m not sure where you got that impression. You do a low thrust transfer when you’ve got an efficient engine and a high delta-v budget. You’re never going to do a two-impulse Hohmann transfer with an ion engine or the wimpy little thruster in this lander, so you break it up over time. I’d also disagree with your assessment that this is a ballistic capture, as the lander is performing an insertion burn when it reaches the Moon. As the name implies, a ballistic capture uses the gravitational pull of the planet/moon your approaching to put the craft into orbit without doing the burn. That’s a huge part of the energy savings. Can you explain or give a reference how this works? I tried several years ago to model this, and could not get it to work, at least not without aerobraking (or impacting the body itself). Intuitively, you must enter the object’s sphere of influence on a hyperbolic orbit (i.e., escape trajectory), and therefore must also leave, albeit in a different direction (and likely different momentum relative to your original). Without some kind of impulse or aerobrake or tidal effect, or some other energy loss mechanism, it appears there’s nothing to keep the entering object from just departing again with the same energy (relative to the object). This is fundamentally a 3-body problem – you can’t think of it terms of conics and spheres of influence. The closest you can think about it is that you put yourself to hit apoapsis from your “source” while the “target” is approaching you. So imagine you hit that point and it’s ludicrously elliptic, so your velocity along the orbit of the “target” is zero. Then, in the “target” frame, you’re approaching it with a velocity of “-vtarget”, which means you fall in, and then back out with “+vtarget” – meaning in the source’s frame you’re now moving with “+2*vtarget” velocity along that axis. But your original orbit was so eccentric that it extended between the source and the target, which means the redirected one can, too. So your redirected orbit can, for instance, get close enough to the source object to be influenced by it again, redirecting it again and putting you into some eccentric orbit around a Lagrange point. The energy loss mechanism is the other object. In the Earth-Moon case you can imagine that as you head out away from the Moon, you can *lose* energy along the path by approaching the Earth from “behind”, so the Earth drags on you. You’re right that you can’t transfer to a “classically bound” conic-section type orbit, it’ll always be a mess and if you don’t have *some* burn at some point, you’re almost certain to go “boom” and collide with one of the objects. But the big advantage here is that the burn itself isn’t nearly as time-sensitive as a normal LOI burn. >>This is fundamentally a 3-body problem – you can’t think of it terms of conics and spheres of influence. Actually, you can, It’s not perfect — we all know the 3-body problem is insoluble — but there is a method called the Patched-Conic Method, which does a pretty fair job at approximating the situation. It works because when the spacecraft is on the Moon’s sphere of influence (SOI), the gravitational accelerations due to both Earth and Moon are very low. The PCM works _VERY_ well for planets, where the diameter of the SOI is tiny compared to planetary distances. Not so much for the Earth-Moon situation,where the SOI is much larger — 7 times the Earth-Moon distance. Still, it’s a useful way to understand the problem. In your earlier posts, I think you’re thinking of interplanetary missions, where you’ve got time to run ion engines or something, that can do a slow burn to reduce the relative speed. But this doesn’t work for the Moon. Things are happening fast, and you either hit the LOI burn or you don’t. In any case, the LOI burn is best done at perilune. I got it from the fact that they don’t carry enough fuel to do a normal TLI/LOI burn. Watch the video at 1:52 (or 2:00). They hit apoapsis ahead of the Moon, then the Moon sweeps in, and they get a gravity assist. 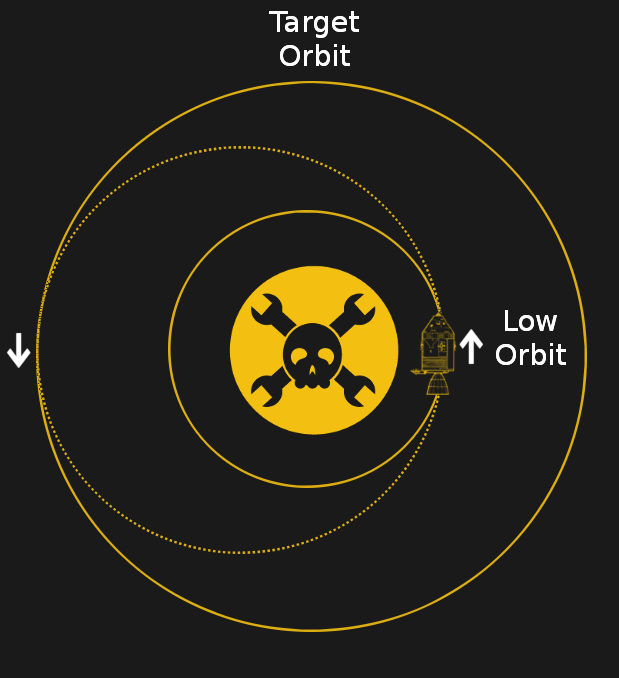 That’s the way a gravity assist works: you let the object approach you in its orbit, and you get a boost equal to twice the planet’s orbital velocity. Setting a criteria to call something a ballistic capture to be “no orbit insertion burn” is a little insane, because you have to have *some* burn to circularize/stabilize the orbit. A ballistic capture just makes it less time sensitive, although in the case of a lander it’s still *somewhat* time sensitive because you’re trying to hit a target orbit and you’re tight on fuel overall. I guess I don’t understand what you mean by “ballistic capture.” Can you please clarify? I know you’ve already answered the question, but I didn’t understand your answer. When you say that “you have to have *some* burn” to get into a lunar orbit, I get the impression that you think the Delta V is small. It’s not: It’s over 800 m/s, which is OTOO the TLI burn from Geosync altitude. Which leaves another 2 km/s to get onto the lunar surface. It’s also not something you can do leisurely. After a month-long trip from the Earth, you’ve got a window of about 10-20 minutes to get the LOI burn right. It’s not a matter of not having enough propellant, this mission has A LOT of propellant. Keep in mind that they are doing the TLI burn, lunar insertion burn, propulsive landing, and even “hops” on the surface using the same engine/tankage. If you look at the wet/dry mass of the lander, the thing is all gas. The problem is that it doesn’t have enough thrust to put out the required energy during perigee, so it has to do it over several orbits. The only thing they are saving going this route is money. It let them put a smaller engine in the lander and keep it light enough to go as a secondary payload. If money was no object, they would have put a bigger kick stage on or just paid full price and have the F9 throw them into TLI. Buzz gets it exactly right. Next episode/challenge for you guys: describe in simple terms (like this article) how the J2 perturbation term in Earth’s gravitational potential is exploited to make polar orbiting satellites precess one rev per year to stay synchronous with the sun — a crucially-important property for earth observation satellites, and a glorious hack to boot. 1) The multiple burns are required because, as you say, we don’t have a J-2 engine to use. There’s actually a shortage of off-the-shelf thrusters to use. Most available motors are either too weak (example, attitude control thrusters) or too big. The best we can find are “kick motors” used to insert comm satellites, etc. into GEO. These motors don’t really have enough thrust to accomplish TLI with a single burn, which is wht we have to break TLI up into multiple apogee-raising burns applied at perigee. 3) The trajectory after TLI is a long, narrow ellipse with a low-altitude perigee and an apogee near the Moon’s orbit radius. At apogee, it’s going to have a horizontal velocity of around 200 m/s, The Moon itself, though, is moving at 1000 m/s, So we have 800 m/s too much speed. We’re not exactly doing a rendezvous with the Moon — We’re throwing ourselves in front of the Moon, going “Booga Booga,” and daring it to try to run over us. Relative to the Moon, the trajectory will be hyperbolic. The challenge for LOI is to kill enough speed to turn the hyperbola into an ellipse. 4) Just as the best way to perform the TLI is to burn at perigee, the best way to slow down is to apply the LOI burn at perilune of the hyperbola. 5) You can pass the Moon either on the back side, like Apollo, or the front side, like Beresheet. If you do a back-side pass, you end up in a retrograde orbit around the Moon (clockwise as seen from the North pole). Use the front-side pass, and you get a posigrade orbit. Either way, you still need to apply the LOI burn opposite your current velocity. At least, not without using a “Weak Stability Boundary” (WSB) trajectory which is a topic for another day. So we are slowly reaching an understanding that we are all “allowed” a certain co2 budget in a monumental effort to stop the climate catastrophe…. so how is it that these scientists completely miss the consequences of such ridiculously polluting things as space launches? Can this really be called science or research when we haven’t even come to grips with maintaining our own house from collapse? A Falcon 9 uses 155 tonnes of RP1 (a highly refined form of kerosene). A Boeing 777 burns roughly 90 tonnes of JP1 (a less refined form of kerosene) on a long haul flight. A short-to-medium flight in a 737 can burn close to 10 tonnes of fuel. There are more than a hundred thousand flights per day, so the airline industry alone burns as much fuel in a day as roughly five to ten *thousand* Falcon 9 launches. The aviation industry produces about 2% of global carbon emissions. (Coal fired power stations account for ~30%, IIRC, so about 75,000-150,000 Falcon-9 launch equivalents). Rational allocation of limited resources is a laudable goal. Blindly spouting rhetoric is thoughtless. One F9 flight emits less CO2 than a single transoceanic airliner flight. Heck, an F9 flight emits less CO2 than a small city’s people *exhale* in a single day, and much less than the output of a coal power plant in a single hour. Have some perspective, and do a bit of thinking before crying out that the sky is falling. Others have mentioned how little (comparatively) CO2 a Falcon 9 puts out, so I won’t repeat the points already made. But I think it’s worth mentioning that rockets which run on hydrogen/oxygen literally produce water as their exhaust, and the trend in some newer engines (such as the Raptor SpaceX is developing) is to use methane/oxygen, which produces far less CO2 than the kerosene/oxygen used in the Falcon 9. So to put into perspective how much of a non-issue this is, the Falcon is actually one of the “dirtiest” rockets out there, and still is only emitting as much CO2 as a few commercial airliner flights. Yet another point: Rockets are necessary (currently) to launch the satellites that monitor the climate and the atmosphere. Without using rockets, our knowledge of climate change would be substantially less, reducing our ability to do anything about it. The same method followed my Mars orbital mission(MoM) of ISRO. So, it will land today!